The intelligentsia (Latin: intellegentia, Polish: inteligencja, Russian: интеллигенция; IPA: [ɪntʲɪlʲɪˈɡʲentsɨjə]) is a status class of people engaged in complex mental labors meant to guide, to critique and to assume leadership in shaping the culture and politics of their society. As such, the intelligentsia might include artists, school teachers, academics, writers, journalists, and other hommes de lettres (men of letters). Historians debate the political role of the intelligentsia as a progressive influence and as a regressive influence upon the development of modern societies. As a status class, the intelligentsia arose in the late 18th century, first in Russian-controlled Poland during the age of Partitions (1772–1795). During the 1840s Polish society borrowed the term intelligentsia from the German philosopher Georg Wilhelm Friedrich Hegel to identify and describe the educated and professionally active social strata of the patriotic bourgeoisie, who were capable of acting as the cultural leaders of a country ruled by an authoritarian foreign power (the Tsarist Russian Empire controlled much of Poland from the late-18th century until the First World War). Moreover, in the early 20th century, before the Russian Revolution (1917) the term intelligentsiya described the status class of educated people whose cultural capital (schooling, education, enlightenment) allowed them to assume political leadership. Deprived of the socio-political influence derived from the "effective levers of economic development", the intelligentsia occupied the cultural periphery of society in Eastern Europe, unlike in Germany and Great Britain, where the Bildungsbürgertum (the "cultured bourgeoisie") and the British professions had defined roles within their respective societies. The emergence of intelligentsia preceded the term 'intelligentsia' as proposed by the Polish Romantics. It was associated with the development of cities, the mass spread of printing and the construction of tenement houses available for rental occupancy in the urban core. That's where the embryonic intelligentsia: journalists, teachers, civil servants, could find an apartment outside traditional class divisions. In the opinion of historian Maciej Janowski (The Rise of the Intelligentsia, 1750–1831) the new intelligentsia became "servants" to the modern state in the degree that the state they served, i.e. the partitioned Poland became increasingly backward and repressive. 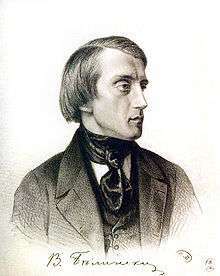 In the Polish language the term 'inteligencja' was popularised in a meaning close to the present one by the Polish philosopher Karol Libelt, and became widespread in Polish science after the publication of his O miłości ojczyzny (On Love of the Fatherland) in 1844. In this publication he defined "inteligencja" as well-educated members of the society who undertake to lead others in a moral capacity as scholars, teachers, lawyers, clergy, engineers, etc., and who guide for the reason of their higher enlightenment. The term was also popularised by a Russian writer, Pyotr Boborykin, in the 1860s, who proclaimed himself the "godfather" of the notion. He claimed that he borrowed the term from German culture, where the term Intelligenz denoted the social strata of people engaged in intellectual occupations, however he insisted on a special meaning of the Russia term, which had an additional implication of high intellectual culture. From there it came into English and several other languages. In English this word is often applied to the "intelligentsia" in Central European (like Poland) and Eastern European countries (like Russia) in the 19th and 20th centuries. A narrower term 'intellectuals', according to Pierre Bourdieu, can be applied to those members of intelligentsia who not only work using their intellect, but also create cultural wealth. The emergence of elite classes of intellectuals or well-educated people had been observed in other European countries (e.g., intellectuels in France and Gebildete in Germany) as well. independence, aspiration toward freedom of self-expression and finding of themselves in it. The term intelligentsia was first used in Poland by Karol Libelt in 1844. The Polish intelligentsia specifically was considered the leaders of the modern Polish nation. Members of the intelligentsia were well aware of their social status and of their duties: educating the youth with the objective to restore the Republic of Poland, preserving the Polish language and patriotism were considered the most important. However, some intellectuals (e.g. Stanisław Brzozowski or Tadeusz Boy-Żeleński) criticised traditionalism and conservatism prevalent in Polish culture. Many of the political elites emigrated from Poland from 1831 to 1870 in the Great Emigration and many based themselves in France. After the invasion of Poland in World War II the Polish intelligentsia were special targets of the Nazis (see Special Prosecution Book-Poland, German AB-Aktion in Poland, Intelligenzaktion, Intelligenzaktion Pommern etc.) and the Soviets (see Katyn massacre). Russian intelligentsia had a similar mixture of messianism and intellectual elitism. Isaiah Berlin has described it as follows: "The phenomenon itself, with its historical and literally revolutionary consequences, is, I suppose, the largest single Russian contribution to social change in the world. The concept of intelligentsia must not be confused with the notion of intellectuals. Its members thought of themselves as united by something more than mere interest in ideas; they conceived themselves as being a dedicated order, almost a secular priesthood, devoted to the spreading of a specific attitude to life ..."
The idea of progress, which emerged in the Western European Enlightenment, became dominant among intelligentsia in the middle of the 19th century. Progressive social movements, such as Narodniks, consisted largely of intellectuals. According to the Russian philosopher Sergei Bulgakov, Russian intelligentsia was the "creation of Peter", the "window to Europe through which the Western air comes to us, vivifying and toxic at the same time." He also called the influential literary critic of Westernizing tendency Vissarion Belinsky the "spiritual father of Russian intelligentsia". "How repulsive I find that word". In 1860 there were 20,000 Russian professionals, 85,000 by 1900. Originally composed of nobles, the intelligentsia came to be dominated by classless people (raznochintsy) after 1861. In 1833 78.9% of secondary school pupils were sons of nobles and bureaucrats, by 1885 they were 49.1%. The proportion of commoners rose from 19 to 43.8% (the rest were priests' sons). Nicholas I kept the number of university students at 3,000 per year, fearing a large intellectual proletariat. By 1894 there were 25,000 students. Similarly the number of periodicals increased from 15 in 1855 to 140, 30 years later. The "third element" were professionals hired by zemstva. By 1900 there were 47,000 of them, most were "liberal radicals". Revolutionaries avoided zemstva on principle. In the ideology of Bolsheviks, intelligentsia is not a real class; its status is described by the Russian word prosloyka, which is normally translated as "stratum," but in this context has a negative connotation, meaning "liner" or "separating layer". In other words, intelligentsia does not have a "real" place in the structure of the society: it is a midlayer between "toilers" and "exploiters". Intelligentsia grows by means of "recruiting" from among the people of labor, but its produce, i.e., the produce of its intellectual labor is just a sort of goods ordered and paid by the exploiter class. Hence its independence is a mere ideological illusion, and in fact intelligentsia is by large a class of "lackeys" of bourgeoisie and landowners. While de facto being an exploited category, en masse it lacks the revolutionary drive. Ironically, this theory was put forth by the representatives of intelligentsia itself, notably Vladimir Lenin and Leon Trotsky among many others. In particular, Lenin is famous for his caustic remark that "[the] intelligentsia is not the 'brain of the nation', it is the 'feces of the nation'". The Russian Revolution polarized the Russian intelligentsia, together with all other strata of the society. Some of them emigrated, some joined the White movement, some joined the Bolsheviks (and some were Bolsheviks from the very beginning), some tried to oppose Bolsheviks within the political framework of Soviet Union, some remained passive. Eventually the Bolsheviks got rid of all opponents by various means, ranging from forced deportation (e.g. on Philosophers' ships) to execution. The remaining intelligentsia were supposed to serve "the cause of working class". While the importance of this class was not underestimated, it was treated with reservation. The fervent drive for professional education gave birth to new Soviet intelligentsia, which gave the current meaning to the term. Originally, this new class wasn't clearly defined; instead, the labor of skilled professionals, scientists and artists was likened to proletarian labor in the different field. These professionals were officially unified under institutions similar to workmen unions (for examples, the Writers Union or the Composers Union) and given strict standards for evaluating their work, enforced by the corresponding expert boards. In the late Soviet Union the term "intelligentsia" acquired a formal definition of mental and cultural workers. There were subcategories of "scientific-technical intelligentsia" (научно-техническая интеллигенция) and "creative intelligentsia" (творческая интеллигенция). 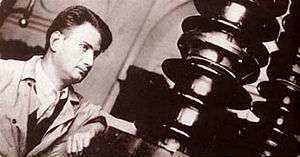 Igor Kurchatov – employee of the Radium Institute. Mid-1930s. The approach to intelligentsia was varying: for example, scientists were kept in check by ideological sections of their universities, and, if doing sensitive research, were restricted both territorially and socially to so called "closed institutes" with top secret clearance or even "closed cities" that gathered such scientists in remote research and development campuses. Artists, on the other hand, weren't contained physically, but any release, publication or performance needed to go through Union evaluation; their "means of production" (from printing presses to film labs) were strictly regulated and centralized. Therefore, Soviet Union was able to let the natural creative process crucial for nation's survival continue, but at the same time didn't allow for any official and ideological authority for the intellectual class on its own, as a social class. In the post-Soviet period, the members of the former Soviet intelligentsia have displayed diverging attitudes towards the communist regime. While the older generation of intelligentsia has attempted to frame themselves as victims, the younger generation, who were in their 30s when the Soviet Union collapsed, has not allocated so much space for the repressive experience in their self-narratives. Since the collapse of the Soviet Union, the popularity and influence of the intelligentsia has significantly declined, therefore it is typical for the post-Soviet intelligentsia to feel nostalgic for the last years of the Soviet Union (perestroika), which they often regard as the golden age of the intelligentsia. Some authors use the term "intelligentsia" in reference to intellectuals and certain upper middle class professionals, whose main task is to create and distribute knowledge. Max Weber considered intelligentsia to be a major category essentially distinct from other social categories, both in terms of attributes and interests. In his major work, Economy and Society he used this term in arbitrary chronological and geographical frames, e.g., he wrote that "this Christian preoccupation with the formulation of dogmas was in Antiquity particularly influenced by the distinctive character of 'intelligentsia', which was the product of Greek education". When formulating major social classes of his time, Weber combines intelligentsia with other social categories, e.g., he defines a major class consisting of "the propertyless intelligentsia and specialists (technicians, various kinds of white-collar employees, civil servants – possible with considerable social differences depending on the cost of their training)" and yet other "classes privileged through property and education". The term mass intelligentsia describes the 20th century expansion of tertiary education to a saturation never seen before in history, and the resulting increase in moneyed adults curious about subjects, scientific, philosophic and humanitarian, beyond their own square on the chessboard. The term has been used regularly by sociologists but was widely popularised in the 2010s by English broadcaster and writer Melvyn Bragg. Bragg says it explains the popularity of book clubs and literary festivals that would historically have commanded little interest from the mass of middle- and working-class people. One author who has explored expressions of the rising mass intelligentsia is British writer Jules Evans. He takes it to include informal learning, espoused by novel teachers such as celebrity chefs and members of an internet forum for new mothers. What Marx could not anticipate ... was that the antibourgeois intellectuals of his day were the first representatives of what has become in our time a mass intelligentsia, a group possessing many of the cultural and political characteristics of a class in Marx's sense. By intelligentsia I mean those engaged vocationally in the production, distribution, interpretation, criticism and inculcation of cultural values. 1 2 3 4 Tomasz Kizwalter (Oct 2009). transl. by Agnieszka Kreczmar. "The History of the Polish Intelligentsia" (PDF file, direct download). Reviews. Acta Poloniae Historica: 241 242. Retrieved 16 December 2013. Jerzy Jedlicki (ed. ), Dzieje inteligencji polskiej do roku 1918 [The History of the Polish Intelligentsia until 1918]; and: Maciej Janowski, Narodziny inteligencji, 1750–1831 [The Rise of the Intelligentsia, 1750–1831]. ↑ Oxford English Dictionary, p. 1387. 1 2 3 Malgorzata Szpakowska. "Dzieje inteligencji polskiej do roku 1918 [History of Intelligentsia before 1918 in Poland]". Zeszyty Literackie (Literary Letters): 1 / 6. Retrieved 16 December 2013. Dzieje inteligencji polskiej do roku 1918 ed. by Jerzy Jedlicki. Vol. I: Maciej Janowski, Narodziny inteligencji 1750–1831; Vol. II: Jerzy Jedlicki, Błędne koło 1832–1864; Vol. III: Magdalena Micińska, Inteligencja na rozdrożach 1864–1918. Warsaw, Polish Academy of Sciences Institute of History – Neriton, 2008, s. 260, 322, 232. ↑ Dr hab., Prof. UW Andrzej Szwarc (2009). "Kryteria i granice podziałów w badaniach nad inteligencją polską" [Criteria and divisions in research of Polish intelligentsia]. Instytut Historyczny UW (University of Warsaw Institute of History). Retrieved 16 December 2013. ↑ Boy-Żeleński, T. (1932) Nasi okupanci. ↑ See Kaprans, M. (2010) "Retrospective Anchoring of the Soviet Repressive System: the Autobiographies of the Latvian Intelligentsia." In Starck, K. (ed.) Between Fear and Freedom: Cultural Representations of the Cold War. Cambridge: Cambridge Scholars Publishing. P. 193–206. ↑ See Procevska, O. (2010). "Powerlessness, lamentation and nostalgia: discourses of the post-Soviet intelligentsia in modern Latvia." In: Basov, N., Simet, G.F., Andel, J. van, Mahlomaholo, S., Netshandama, V. (eds). The Intellectual: A Phenomenon in Multidimensional Perspectives. Oxford: Inter-Disciplinary Press. ISBN 978-1-84888-027-6. P. 47–56. ↑ "We think, therefore we are - FT.com". ↑ Rockhill, Elena (2011). Lost To The State. Berghahn Books. p. 141. ISBN 978-1-84545-738-9. ↑ "Melvyn Bragg on the rise of the mass intelligentsia". ↑ "A new Enlightenment ... or a new Dark Ages?". ↑ Flacks, Richard (1973). Campus Power Struggle. Transition Books. p. 126. ISBN 0-87855-059-3.